It rained today, which meant that it was time to get the wellingtons out. 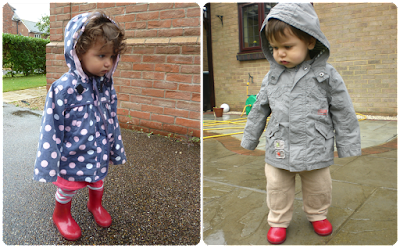 I remember very clearly the first time that I put Harry in wellingtons and took him out in the rain. He walked normally along the pavement, then when he reached his first puddle he immediately stamped in it. It was as though some sort of puddle-jumping instinct had just kicked in. However when I set Mia down next to some puddles she just looked at them suspiciously, before delicately walking straight through them. Even though Harry was right next to her showing her how to jump in them. An example of a classic boy/girl difference? These little red boots have been handed down through the family. I used to wear them myself. Quite an unusual family heirloom, but a useful one at least! Didn't Fredward Bear use to wear them as well? Yes I think that he did! Definitely a boy girl difference I think!